As we all know, celebrities often break into show business through television commercials. Some also use their celebrity influence to become pitchmen (or women) for certain brands. What I like to reflect on is the earlier scenario, watching some of our favorite movie and TV stars before they were famous. David Mendenhall for Rice Krispies - Before he went Over The Top with Sylvester Stallone, David Mendenhall fueled up with Snap, Crackle, and Pop for his paper route. David starred in this 1984 commercial for Rice Krispies and others like Kenner's 1983 Return of the Jedi Sweepstakes. David was somewhat a celebrity already in 1984, playing as Mike Webber on General Hospital. Besides his movie roles, he would also go into voice acting including several Saturday morning shows and David Witwicky in 1985's Transformers: The Movie. Kirk Cameron for Golden Grahams - Before he was Mike Seaver on Growing Pains, Kirk Cameron was part of another TV family enjoying a box of Golden Grahams. Another one of his early commercials was for Kool-Aid where his little sister tries to cheer him up after suffering a broken arm. Fred Savage for Fruity Marshmallow Krispies - After his role in Princess Bride but before starring as Kevin Arnold in The Wonder Years, Fred Savage appeared in a 1988 Fruity Marshmallow Krispies commercial. He's actually not promoting the cereal but shows up at the end as a stand-up comedian using the free joke machine prize. Fred's early advertising career also included Pac-Man Vitamins and Fruit Roll Ups. Jerry O'Connell for Frosted Flakes - Shortly after his first major role in Stand By Me, Jerry O'Connell bobsledded with Tony the Tiger in a 1987 Frosted Flakes commercial. His advertising career actually began a couple years earlier with a Duncan Hines Cookies ad. 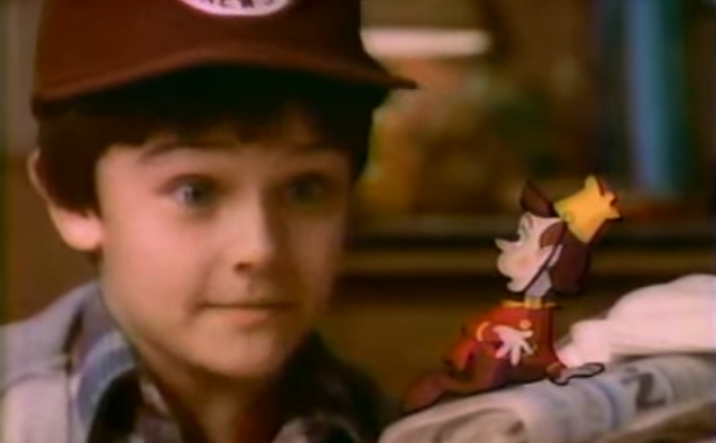 Jason Bateman for Golden Grahams - Before his early TV acting career began with Little House on the Prairie and Silver Spoons, Jason Bateman got his start with this 1980 Golden Grahams commercial.